Caroline P. Thirukumaran, M.B.B.S., M.H.A., Ph.D.
Dr. Caroline Thirukumaran received her Bachelor in Medicine and Surgery (MBBS) degree from the University of Mumbai, and her Master in Hospital Administration (MHA) degree from the Tata Institute of Social Sciences, Mumbai. Following this, she gained considerable experience in hospital planning and operations through her work in tertiary care hospitals in the Indian subcontinent, the Middle East, and Africa. She pursued her PhD in Health Services Research and Policy at the University of Rochester. Caroline's research is enriched by her clinical and managerial experience. She has a profound understanding of the patient-provider relationship, of hospital operations, and of decision-making processes used by the hospital management – all of which provide her with holistic understanding of the dynamics involved in providing high-quality, and patient-centered hospital care. Health Services Research (HSR) is a field of inquiry that integrates in-depth knowledge of the healthcare system with theory and advanced statistical methods to investigate issues related to quality, cost, and access to care. As a health services researcher, Caroline's primary research interests are at the intersection of health policy, and the quality & safety of orthopaedic care in hospitals. 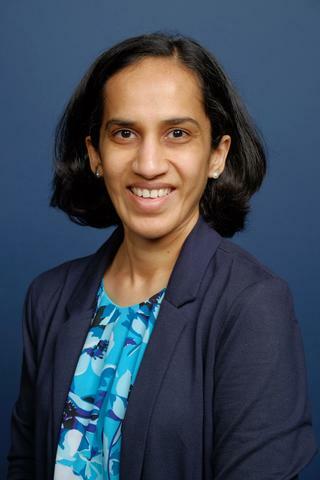 Broadly, she is interested in understanding the drivers and determinants of high-quality orthopaedic care, and in particular, care for the vulnerable population including the elderly and those that are at risk of health disparities. She has expertise in the use of large medical and administrative datasets to address the research questions. The overarching goal of her research is to generate knowledge that will contribute in reducing variation in the outcomes of orthopaedic care. Schwarz EM, Parvizi J, Gehrke T, Aiyer A, Battenberg A, Brown SA, Callaghan JJ, Citak M, Egol K, Garrigues GE, Ghert M, Goswami K, Green A, Hammoud S, Kates SL, McLaren AC, Mont MA, Namdari S, Obremskey WT, O'Toole R, Raikin S, Restrepo C, Ricciardi B, Saeed K, Sanchez-Sotelo J, Shohat N, Tan T, Thirukumaran CP, Winters B. "The 2018 International Consensus Meeting on Musculoskeletal Infection: Research Priorities from the General Assembly Questions." Journal of orthopaedic research : official publication of the Orthopaedic Research Society.. 2019 Apr 12; Epub 2019 Apr 12. Thirukumaran CP, Glance LG, Cai X, Balkissoon R, Mesfin A, Li Y. "Performance Of Safety-Net Hospitals In Year 1 Of The Comprehensive Care For Joint Replacement Model." Health affairs.. 2019 Feb 0; 38(2):190-196. Wolcott K, Schriefer J, Michels J, Meyers J, Hilt S, Gitzelmann C, Pegoli W, Caserta M, McGuire A, Thirukumaran C, Pulhamus M, Foito T, Sanders J. "The Business Case for Surgical Quality - Using a Multidisciplinary Team to Drive Pediatric Surgery Quality Improvement". Journal of Pediatric Surgical Nursing. 2019; 8(1): 15-20.